Today a total of 12 Pilot Whales were brutally slaughtered and 4 babies were left motherless and dumped back out to sea. The chances of their survival are slim to none after enduring such stress and trauma. Many of the “slaughtered” whales were still alive and conscious as they were dragged out of the killing cove and into the butcher house. People are familiar with Bottlenose Dolphins but some other members of the Blackfish family, including Pilot Whales are not so well known. So to honour the poor pods that have the misfortune to cross paths with the Taiji drive hunters I thought I would give some information on them. Firstly, it is not a whale but a dolphin. It had a head that looks like a black pot so it was once called a “pothead” by early whalers. The Latin name is “Globicephalia” or “Globe Head”. If you have heard of them it may be due to activities in the Faroe Islands which is a Danish island in the North Atlantic Ocean.. They have been hunted off those coasts for hundreds of years. In those hunts entire pods are rounded up by boats and driven towards the coastline where they are dragged ashore and killed. In the last decade, an average of 1,200 individual pilot whales have been killed each year in this way. Despite condemnation Faeroese people defend this hunt vigorously, and maintain that it is long-standing tradition. That word again eh? Just because something is tradition does not mean that it is right. “Spare the rod spoil the child” was one such human tradition and now this is outlawed as we have grown in consciousness and materialised The Children’s Act. How are we supposed to react when the only defence is that it is tradition?. Oh well, you should have said and we would accept it. Not a chance. Not in the 21st century. Pilot whales live in large schools, sometimes hundreds or thousands, feeding mainly on squid. They, like bottlenose and orcas have been kept in oceanariums and trained to perform. A new study shows that they stay within a few metres of each other as they dive, and even stroke each other with their flippers. After all, if you’re going to venture into the darkness, it helps to have a hand to hold. Such nested social structures are rare in the animal kingdom, and require a fair amount of intelligence to manage. He points out another fascinating fact about pilot whales. They practise an exercise called “synchronous breathing”. Pairs of them will break to the surface and breathe as one unit. We did not invent synchronised swimming. We synchronize our watches but do we syncronise our breathing? Something tells me that there is more to this practice than meets the eye. Animals have a different way of being and use a different kind of intelligence to ours. We can try to mimic it or define it in human language but we really have not got the mindset to really grasp what a certain behaviour means to the animal. 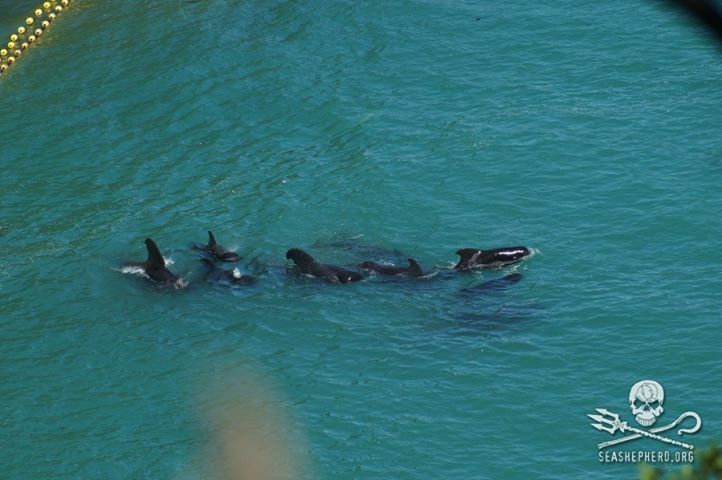 Just a little bit on Pilot Whales on this sad day for cetacean defenders. Ah well.It is so glum that we come to learn about these magnificent cetaceans because they are being barbarically hunted and killed. Not in my name and I know that there are many others who can say the same. Synchronised condemnation. There are pods of us who synchronise their thoughts and tears for you Pilot Whales. We will continue to campaign for freedom for your species. This entry was posted in Dolphin, Environment, Taiji Terror Tales, whales and tagged Faroe Islands, pilot whales, Taiji, Taiji Terror Tales. Bookmark the permalink.